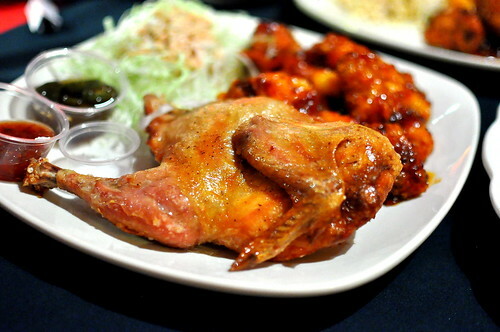 Tis the season for turkey, but I can’t get my mind off of Korean fried chicken. A few years back, I’d frequent “KFC” joints several times a month, power ranking each spot as I went along. I lost my momentum and enthusiasm somewhere along the way, but quickly picked up where I left off at The Prince. 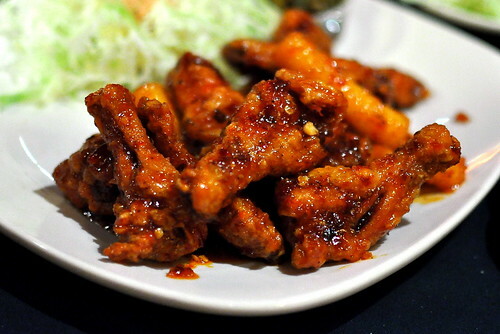 Fingers sticky and lips burning, it was easy to remember how these deep-fried birds found their way into my heart. 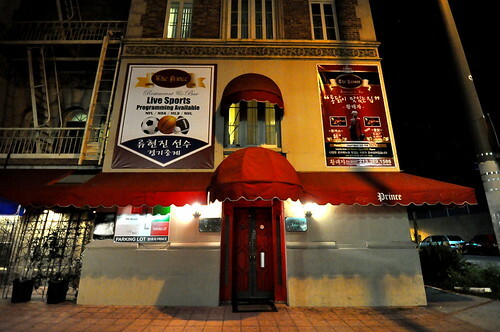 According to the restaurant’s website, The Prince was originally known as The Windsor. 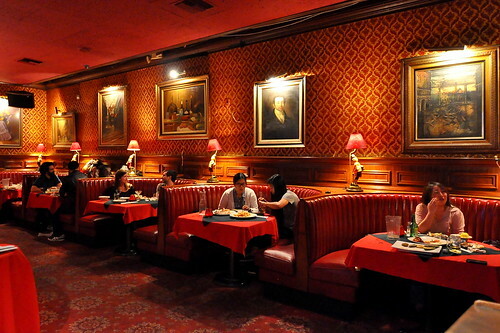 The interior, forever frozen in the roaring ’20s, boasts a genuinely stately feel with ruby red accents at every turn—from the carpet to the wallpaper, lamp shades, and table cloths. As luck would have it, our party of five was seated right next to the pianist. He warmed our hearts and spirits with his rousing renditions of “Let it Be” and “Hotel California.” The best seat in the house! And then there was fried chicken, lots of fried chicken. First up, a “Half & Half” platter of “Fried Chicken” and “Spicy Chicken” accompanied by Thousand Island-dressed cabbage and a trio of accouterments (coarse salt, soy sauce, and chili sauce). Skin taut and crisped just so, the batter-less “Fried Chicken” was simple and fabulous. 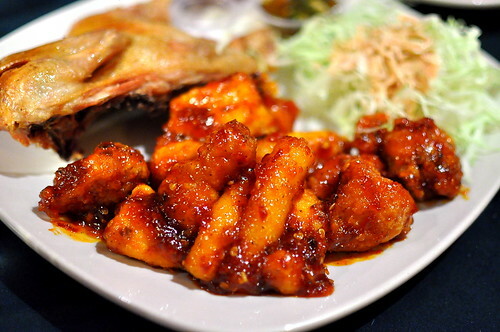 On the flip-side was the equally exceptional “Spicy Chicken,” delightfully slathered in a sweet and scorching sauce. What put this preparation over the top for me was the blistered dukbokki (spicy Korean rice-cakes) in the sticky mix. Y’all know how I feel about dukbokki! Two orders of “Spicy Chicken”—double the dukbokki fun! 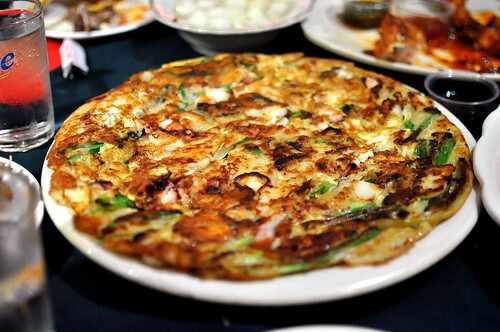 To round out our fried chicken feast, we shared the “Seafood Pancake with Green Onions.” Thick, doughy, and packed to the max with squid and onions, this pancake was a filling endeavor. The spicy soy sauce served on the side was essential for balancing out the flavors. 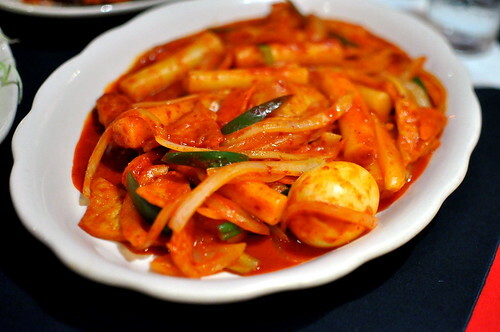 And finally, a classic dukbokki preparation with plenty of fishcakes and a hard-boiled egg. The sauce, more sweet than spicy, coated every crevice. Welcome back into my heart (and stomach), Korean fried chicken. It’s been way too long. I’ve never heard of this place or tried Korean fried chicken before – so this might just be the place to give it a shot! 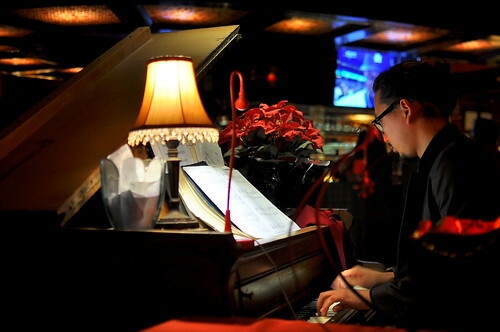 I haven’t seen a pianist in a restaurant in the longest time – it’s cool this guy played some cool songs. I wish they had something like this in SD. The Prince is really somethin’ special, Faye! For a little primer on yangnyeom dak (Korean fried chicken), check out my piece for Saveur magazine circa 2010. Thanks for the link – I just read it and it was quite insightful. San Diego doesn’t have a decent KFC so I think it might be worth a trip to LA to try the KFC there.